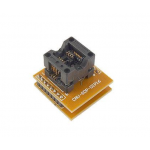 Purchase online SOP 14 to DIP 14 Pin IC Test Socket Programmer Adapter in India at low cost from DNA Technology, Nashik. Want to test 14 pin SMD IC's before soldering in your product or if you want to program SMD 16 pin micro-controllers then this is the perfect 14 pin SMD ZIF Adapter for you. This is basically a Zif Socket for 14 pin SOP Package SMD IC's also called as SMD IC programming adapter or Adapter seat CNV-SOP-NDIP16. 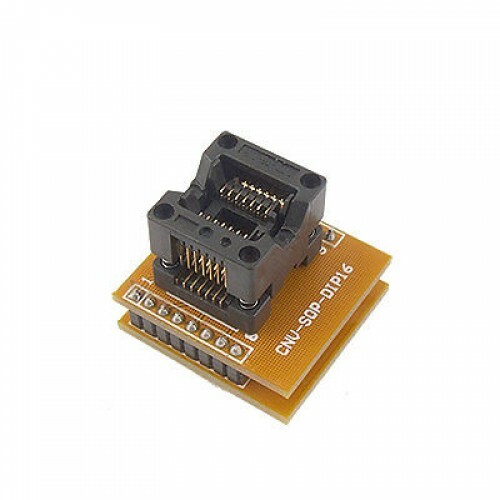 If you want to program any 14 pin SMD controller then just plug in the controller in this zif socket and place it in your programmer and you can then program the SMD controller as you program a DIP micro-controller. Applicable models: All of the programmer: For example: ALL 11, Superpro, RF, LabTool48uxp, G540, Picstart-Plus, SPI-100A. 16 pin SMD ZIF AdapterWant to test 16 pin SMD IC's before soldering in your product or if you want t..
TQFP32, LQFP32, QFP32 to DIP 28 SocketZif Programming Adapter for SMD ATMEGA328 ICHaving problem pro..